Edge Lit Strip is ideal for where you want to create light around letters or to embed it into acrylic for illuminated shelves. Just 1.3mm deep by 8mm wide! 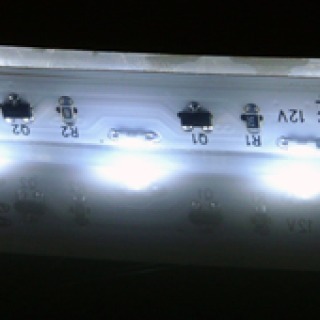 Our Edge Lit LED Strip has tiny LEDs soldered right at the edge of the flexible circuit board. This makes it ideal for creating light contours or light outlines. 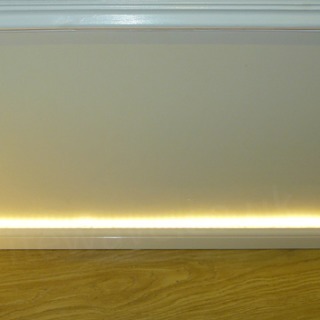 As with our other LED Strips it can be cut and joined to the lengths you require. There are cutting points every 50cm (2 inches). To join one length to another simply solder 2 wires onto the solder pads at the end of the first LED Strip and then solder the other end of the wires to the start of the next LED Strip in the series. 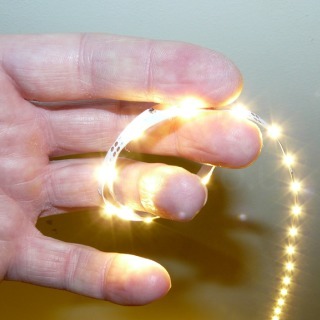 Different colours of LED Strip can be connected together if required. Edge Lit Strip lends itself for some very creative lighting. For example grooves can be routed into wood or metal and the strip inserted to illuminate the grooves. The grooves do not have to be straight they can be circles or even characters or letters of the alphabet. This is ideal where customised signage is required. Due to the low voltage and power requirement of the Edge Lit LED Strip even batteries can be used to power it. You could use 8 Rechargeable AA Batteries to run the sign for around 4 hours, for longer time you could use a larger battery such as a 12v Electric Golf Buggy or 12v Motorcycle Battery. A Golf Buggy battery would provide around 65 hours of power for the Edge Lit Strip.